Hop picking in Otham Nr Maidstone, Kent. We had a moveable sacking lined bin to move as we picked the Hops. Photo sent in by © William Marsh. Starting early in September and at first light, we pulled on the vines to pull them down. Then sat on the side of the bin to pick hops. By the end of the day, our hands were black with hop stain. 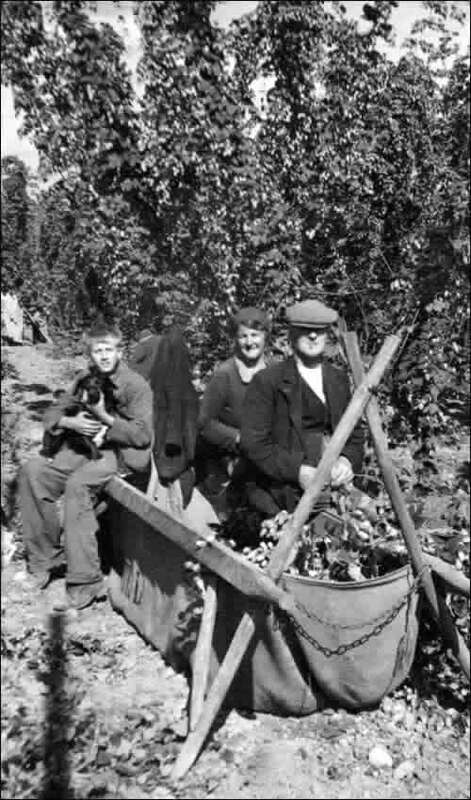 The foreman would come round with the tally man and measure out the hops from the bin with a bushel basket. This would be entered in a book to record payments due. The tractor and trailer would take the collected hops from various bins to the oast house for drying and pressing to go to the Brewery. Usually when we first started to pick hops, the price per bushel was 9d. Then after a few weeks towards the end, it would some times go up to one shilling a bushel. Bearing in mind in old money, there were 240 pence in a pound, 12 pence in a shilling and 20 shillings in a pound. At the end of a long day, we would taken home by an open backed lorry provided by the farmer. Accommodation was provided by the farmer usually in rows of tin huts. Families used to travel from London and treat it as their holiday, and also to earn money.